Commercial and Residential Asphalt Maintenance Services you can TRUST! Armored Sealcoating is happy to help homeowners and businesses throughout the Southern Milwaukee and Racine County bordering areas with your asphalt maintenance. 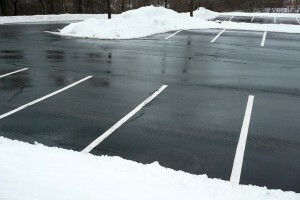 We provide a range of services year-round – including asphalt seal coating, crack filling, and snow plowing. Professional seal coating services are essential to keep your asphalt lasting long term and looking its best! When properly seal coated, your driveway or parking lot will be protected from damaging Wisconsin elements like weather and temperature changes, salt, motor oil, and UV Rays. Seal coating also helps your asphalt continue to have a fresher looking appearance. Armored prides itself in quality – with top grade materials lasting 3-5 years vs. the typical 1-2 years many sealcoating companies promise. Potholes are an inconvenience; they’re also a safety hazard. We’ll evaluate the damage to your pavement and recommend asphalt patching if it’s the best solution. It’s better to have your potholes repaired sooner rather than later. Patching may not be possible if the damage is too severe. Cracks in your asphalt can lead to some serious issues. The longer you let a crack in your asphalt go, the more the damage can spread. Crack filling can prevent the cracks from getting too deep to the point of needing your asphalt completely replaced. You can also use crack filling to prevent the cracks from spreading over a larger amount of area/spider-webbing out. Crack filling is performed before seal coating or used to prevent damage spread between seal coating jobs. Armored Sealcoating provides residential and commercial snow plowing services to help you get through the Wisconsin Winters. We clear snow from driveways, parking lots, walkways and salt icy areas and entryways as necessary. We make snow days less dreadful by doing the snow removal so you can just enjoy the beauty of it. Do you need firewood in Franklin, Wisconsin? We have hardwood and oak firewood for sale – with prices starting at $100. If you have questions or would like to place an order, call us! We’ll fill you in on the details and find out if our stock is the right choice for you. Call Armored Sealcoating at 262-515-4150 or contact us online for your free asphalt maintenance or snowplowing estimate today!